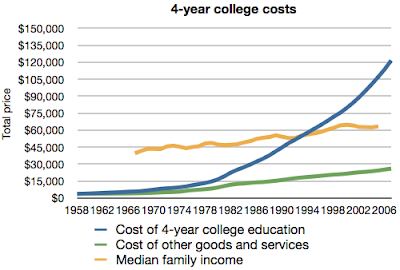 * ... COLLEGE TUITION: My earlier post on the rise in tuition in the Cal State System prompted an e-mail from former Bakersfield resident Sandy Nozick, who follows my blog from her home in Colorado. Like many Californians, she was frustrated by the seemingly endless annual increases in state college tuition. "My daughter left SF State after two years because of money and when she tried to return, she was one of the 20,000 students cut last year and then again one of the 20,000 students cut this year. I worked for the county library. Our staff was cut by one third two summers ago and another 10 percent last summer." Is she happy in Colorado? "The masthead for the late Rocky Mountain News said, 'tis a privilege to live in Colorado.' And it's true." * ... MORE TUITION: And speaking of tuition, another sad and inevitable result of this mess we're in is being playing out in the admissions programs of the UC System, possibly at the expense of California applicants. According to The Los Angeles Times, the cash-strapped UC System is now actively seeking to increase the number of out-of-state students simply to get the extra $23,000 in annual tuition it charges for non-residents. It seems this can only hurt the chances of deserving California students of getting into the already highly competitive UC System. * ... MUSIC AWARDS: Proud parents Linka and Tim Chapman wrote to tell me that their daughter, Celeigh (Kaylee) Chapman, has been nominated for a Hollywood Music Media Award. Celeigh attended Thorner School, then Compton Junior High and later graduated from East High School. She then went on to the USC Thornton School of Music and now works for Sony/Columbia Creative Licensing. She was nominated for the song "I'm Lucky." Good luck to this young achiever. * ... 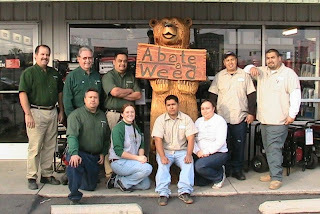 ANNIVERSARY: Nice to hear that Abate-A-Weed, a locally owned weed and insect control company, is celebrating its 45th year in business. The company was founded in 1965 by Jona Feil and Marvin Bartel and later expanded into the sales of chemical and lawn and garden equipment. It changed ownership in 2001 when Dennis Penner and Darrell Feil, Jona Feil's son, partnered together to continue the business. Hats off to these folks. * … DOC BOCK: Heard recently that Matthew Bock, son of local CPA Jim Bock, is well on his way to a career in medicine. Matthew, who graduated from Garces Memorial High, UC Davis and the Drexel College of Medicine, will start a pediatric cardiology fellowship next July at Mt. Sinai Hospital in New York City. It’s a three-year program. He was one of only 125 people to earn this type of fellowship. He is currently in his third year of residency at Loma Linda Children’s Hospital. * ... BAKERSFIELDISM: From reader Jolie Brouttier: You know you're from Bakersfield "if you start salivating at the mouth and thinking about Smith's cookies when you see a yellow happy face!" It might be"a privilege to live in Colorado" but the drive to the coast is a hell of a lot longer.